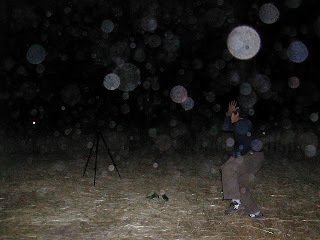 The Balls of Light or Orbs are associated with Crop Circles are also related to healing frequencies crossing over from other dimensions caught on digital and infrared cameras, also seen by eyewitnesses just seconds before an intricate work of sacred art within the pattern of crop circle was formed in the field they were watching that night. It could be the first and most compelling evidence of a mysterious creator of Wiltshire's famous crop circles – a flash of white light and a crop circle appears in front of startled researchers. And all this captured in the dead of night on an array of hi-tech cameras without a sniff of any hoaxers with ropes and boards. Yesterday the crop circle community in Wiltshire was buzzing with probably the most significant single piece of evidence since the entire phenomenon began more than 30 years ago – a crop circle created in front of three eye-witnesses, a bank of light-sensitive video cameras and a mysterious flash minutes before the circle appeared. The incident occurred two weeks ago, in the early hours of July 7. Regular sweeps with infra-red camera Two croppies, Gary King and his friend Paula Presdee-Jones were sitting atop Knapp Hill with a UFO spotter Winston Keech, who was more interested in filming strange lights than crop circles. Their testimony, released for the first time yesterday, is as mysterious as it is compelling. Mr Keech had a series of cameras focussed on the Pewsey Vale below – the heart of crop circle country – and would make regular sweeps of the fields with another infra-red camera. The trio were last able to see the famous East Field at Alton Barnes at 1.35am, before it got too dark to make out the wheat. With the rest of his cameras running, and capturing no light, movement or sound in the field, the trio watched the darkness until a blinding flash of light in the sky hit them at 3.13am. At 3.20am the cameras picked out a huge crop formation. The circles themselves cover an area of more than two acres, and are more than 1,000ft long by 500ft wide. There are 150 individual large circles, with about 60 other smaller 'satellite' circles. It is the biggest formation of the year so far, and kick-started a frenzy of crop circle activity in the Wiltshire countryside – at least 10 other huge formations have been created in the week and a half since. Gary King said: “I have no idea how this formation was created. I just know that it wasn't there at 1.35am, and it was there at 3.20am. Win had lots of cameras filming that field and they picked nothing up, so if there was a huge gang of people there, they used no lights, no lasers, no equipment and made no sound. And they created this huge circle in complete darkness in less than an hour and three-quarters. For me the flash of light is important. It was like sheet lightning, but it was a dull white light for a split second. I knew something had happened right then, and within 10 minutes we were filming the formation. When I was the first to go into the formation at 4am I felt blessed, a great deal of euphoria. “Personally, I feel this should be a catalyst to serious study of what is going on here. This is vindication, it feels like confirmation of all the time and energy everyone has put into this phenomenon over the years.” Cameraman Winston Keech added: “I was careful to do things like make notes of any vehicles passing and stopping, and use handheld cameras to focus on them.